A great day for the United States of America? A reminder of what a great power can do when its back is against the wall? A historic move by a lame-duck administration many thought could no longer solve any problems? It will be some time before we know whether this week will go down in history as all, or even some, of those things. But as the largest bailout in government history unfolded in almost dizzying waves over recent days, a very different view prevailed at the Ayn Rand Center for Individual Rights, an outpost of free-market, anti-government thinking located just a few blocks from the newly aggressive and highly interventionist Department of Treasury in downtown Washington. "It's a complete disaster," said Yaron Brook, the executive director of the center. "Its a form of national socialism of the financial markets...This is socialism 101." Named after the Russian-born novelist who celebrated in her writings the risk-taking individual (and put the black hat on a snivelling, forgiving government that wouldn't let mediocre enterprises and their leaders fail), the center is a lonely beacon of small government and private enterprise in Washington at a time when big government appears to be on the comeback. Black-and-white photos of the controversial writer sit on desktops here; her many novels fill most of the bookshelves; in one office, a blowup of her postage-stamp image (something Rand probably would have abhorred government embrace of her work!)  adorns the wall. Brooke argued that the Bush administration had opted for stability over free markets and noted: "The Soviet Union was very stable too. But where does it end?" Looking across the various levers that Treasury has pulled, Brook was hard pressed to say which bailout was the most egregious in Randian terms, but suggested that the takeover of AIG by Treasury and the Federal Reserve was particularly troubling because there is a chance that the government will actually profit from the selective sale of AIG's assets someday. "The Fed might make a lot of money on the AIG deal," he said. "We're turning the Federal Reserve into a hedge fund." Brook doesn't blame speculators, traders or financiers for the market's near-collapse, but instead blames government for having overregulated the markets in the first place. The business leaders bailed out by government this week "are victims," he said, "and the government set it up." Washington underreacted to previous crisis, let Fannie Mae and Freddie Mac spin wildly out of control as quasigovernment agencies while taxpayers piled up unsecured debt in their names. The crisis, he added, was "really fed throughout by government policies." Brook does not believe a Democratic administration  or a Democratic Treasury secretary  could have moved as aggressively to intervene in private markets as has Hank Paulson, a former Goldman Sachs partner. "Because Paulson knows more about financial markets and is a Republican," Brook said, 'he's doing more than a Democratic would have." 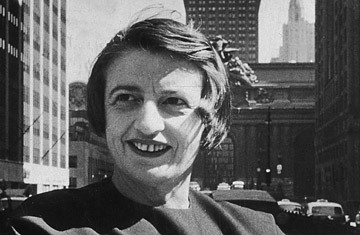 And a lot more than Ayn Rand would have. See the winners and losers of the Wall Street mess here.